Sado Island is located in the middle of Japan ocean. It is in the north of Niigata city. As this island was formed by submarine volcano, the island has very rich amount of natural minerals. In particular, the gold and silver from Aikawa gold mine was very well-known in Japan. It is well know fact that the Tokugawa era was financially well supported by the huge amount of gold and silver. 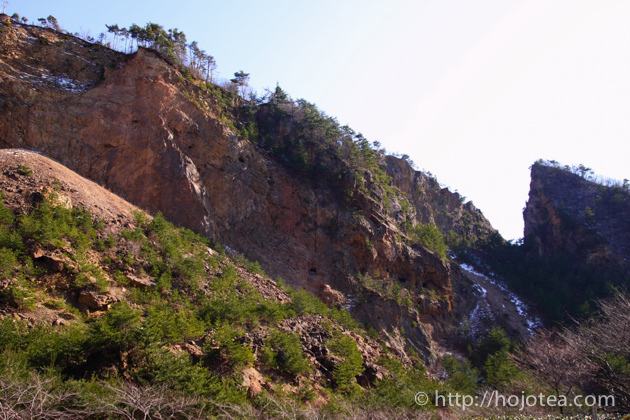 When we walk around Sado Island, we notice that the Island is extremely rich in various kinds of clay. In particular, the red clay from the gold mine was cherished by the people. It was the by-product of the gold and silver mining, and it was used as medicine to stop bleeding. 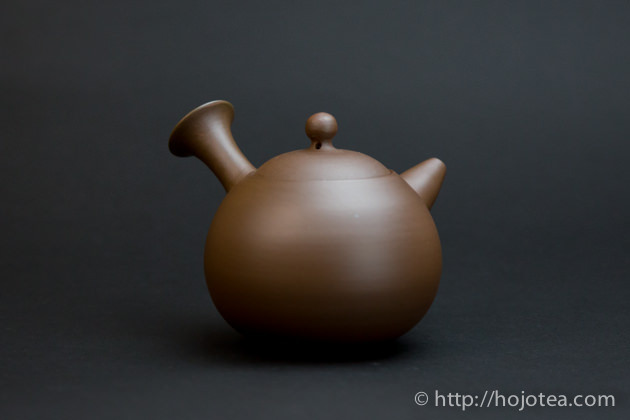 Later on the red clay of Sado Island was also used for making teapot and it was called Mumyoi teapot. 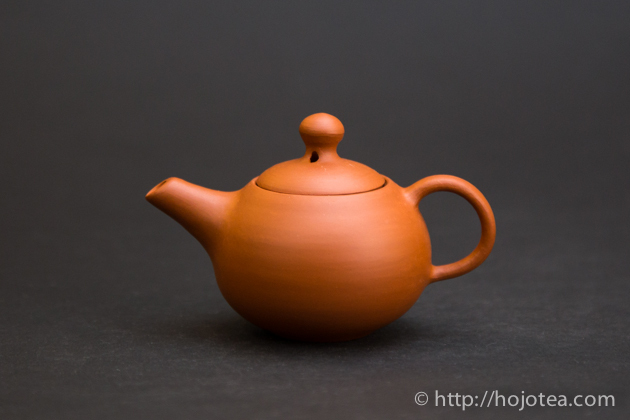 HOJO has been dealing with the red clay teapot of Sado Island for 10 years. As we studied intensely, we got to know that there are many kinds of red clay, and each clay gives totally different effect on taste. Some clay from Sado Island does not even improve taste of tea but to eliminate aftertaste or body and make tea tastes flat; sometimes it causes intense and uncomfortable astringency on our palate. 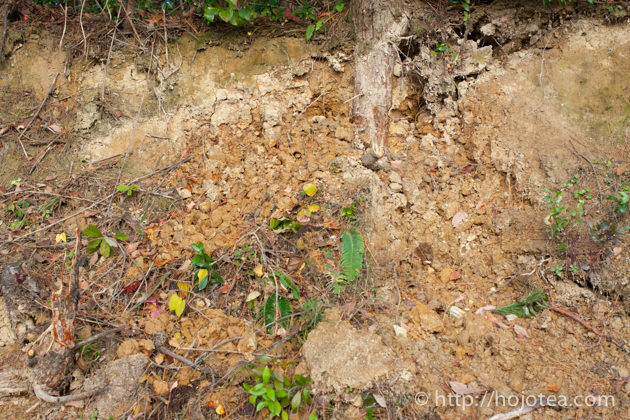 For us, it is very important to identify the clay according to the taste and manage its origin. In a past few years, I was particularly looking for the clay that enhances the body. The body means the width or boldness of flavor/taste. 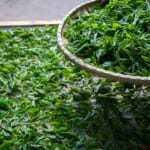 With a full body character, the flavor of tea becomes richer and it stimulates our palate. I have tested many types of clay to look for the character that increases body. 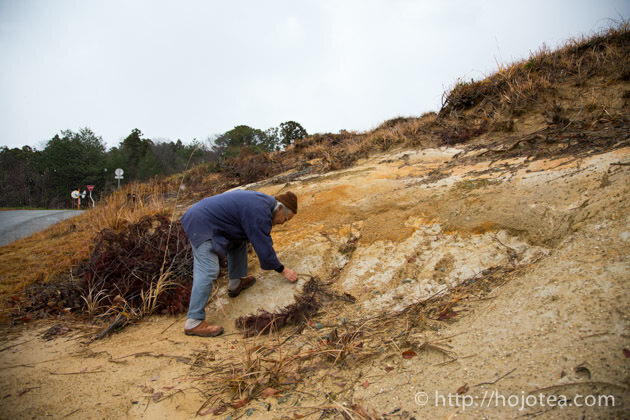 After the series of search and screening, we found the ideal clay from the area called Akitsu. 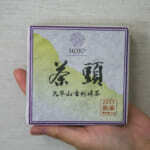 With Akitsu Mumyoi clay, the flavor of fermented tea such as oolong or black tea becomes very brilliant. So far, out of many lineups of clay in HOJO, the enhancement of body by Akitsu Mumyoi clay is very profound. This clay also matches excellently with all types of pu-erh tea too, including both young and vintage raw pu-erh tea. 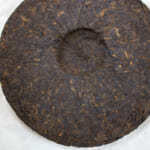 In fact, raw pu-erh tea is one of the difficult teas to pair with the right clay. If an inappropriate teapot is used, it often causes astringent taste on tongue. Since the Akitsu Mumyoi clay enhances body a lot, I often pair this clay with tea that has slim body. 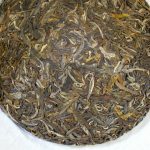 For example, if I brew Ali Shan oolong tea in Akitsu Mumyoi clay teapot, its taste becomes similar to the quality Dong Ding Oolong. The body and the flavor become very rich. I also use this clay for brewing Yan Ming Shan white tea or Gushu Yinzhen white tea. 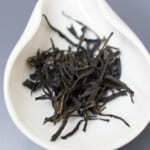 Thanks to the effect with clay, the taste becomes very close to that of Ma An Shan white tea. I also recommend Akitsu Mumyoi teapot for brewing Japanese green tea. 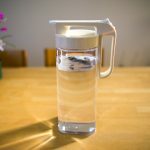 Japanese green tea generally does not have strong body. 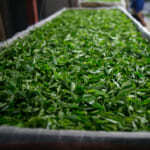 One of the reason is nowadays the stems are removed during tea processing. Without stems, body is generally lighter. Brewing Japanese green tea in Akitsu Mumyoi clay, you will have a new drinking experience of Japanese green tea. 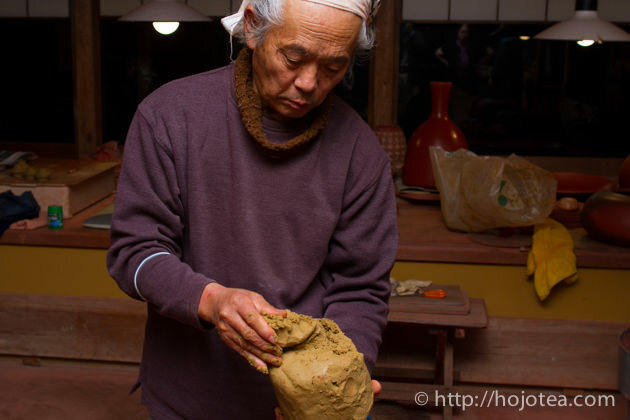 The long-established Mumyoi teapot (Standard Mumyoi Yaki) in Sado Island is traditionally mixing 2 types of natural clay, Nosaka and Mumyoi clay. 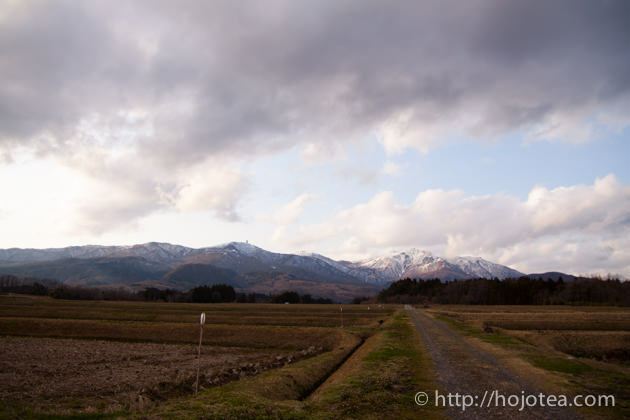 Nosaka is the name of area situated near the Aikawa gold mine. The crude clay of Nosaka is yellowish and it is very elastic. As for Mumyoi, its crude clay is red and less elastic as it consists of coarser particles. It is collected from the Aikawa gold mine or surrounding mountain. Due to less elasticity of Mumyoi clay, it is essential to add-in Nosaka clay in order to increase the elasticity of clay so that it can form the shape on potter’s wheel. 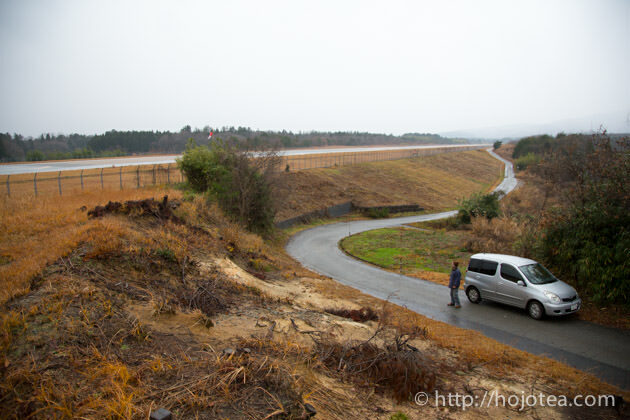 Now the original source of Akitsu clay is occupied by Sado Airport. On the other hand, Akitsu clay is not from Aikawa gold mine. It is from the place called Akitsu, a place located near the Kamo Lake $B!J2CLP8P!K(B. 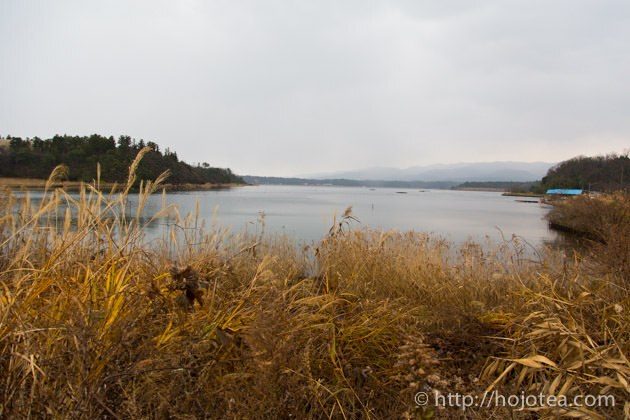 This area belongs to Ryozu town and it is currently occupied by Sado Airport. 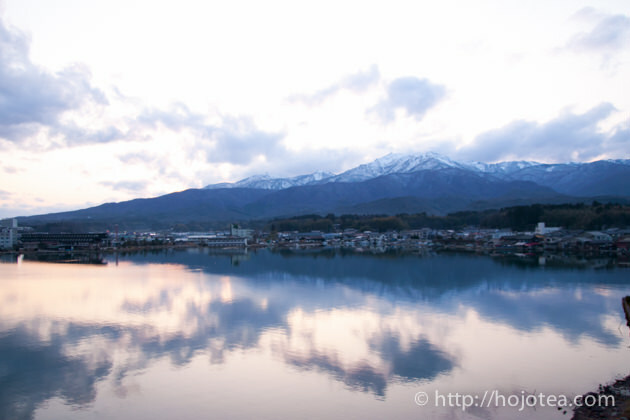 Akitsu is situated on the foot of Great Sado range and it is located at the downstream of the highest mountain called Kinpoku Mountain. The clay was collected by Watanabe Tozo when he was very young; at that time even the Sado Airport had not been constructed. in order to optimize the performance of Akitsu clay. Finally, we could introduce it this year. 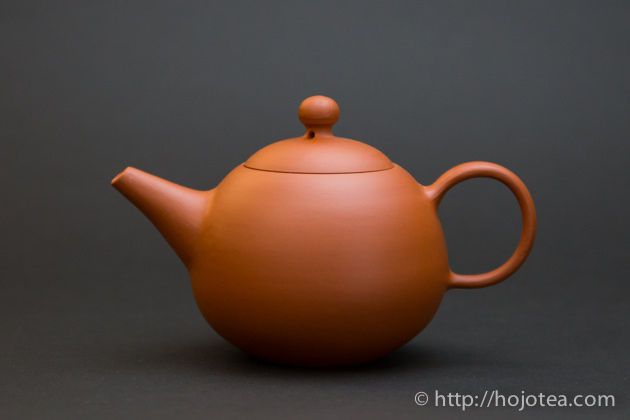 All Akitsu Mumyoi teapots are made of the same clay. It’s the natural red clay collected from Sado Island in Japan. 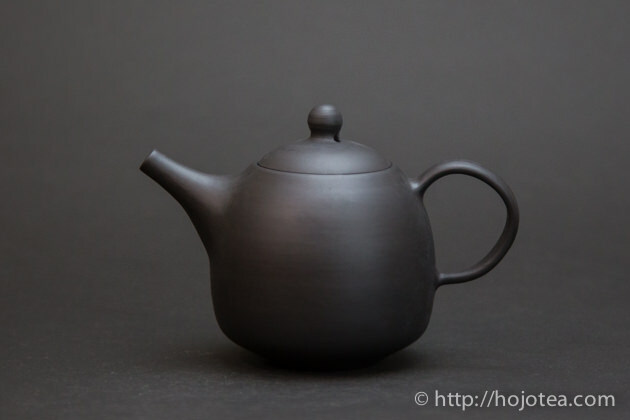 However, these three versions of teapots look different because of the different firing method. 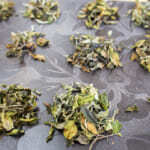 In fact, the difference is not only their appearance, but the effect to the taste of tea is not the same. The oxidation fire means that teapot was fired with oxygen supplied into the kiln. 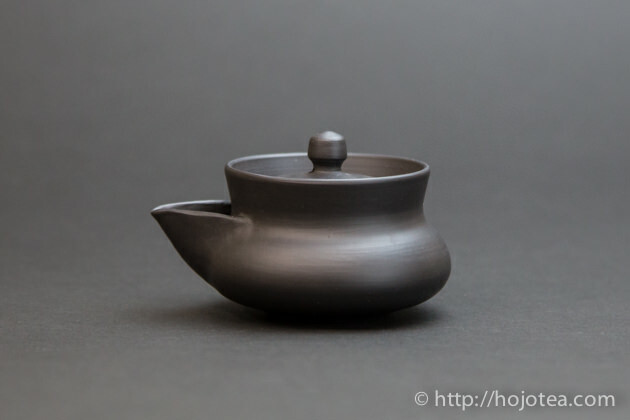 The oxidation fired teapot gives strongest body. This trend is not only seen in Akitsu Mumyoi clay but in all types of clay. Thanks to very strong body, it is definitely suitable for Taiwanese oolong, and Black Tea. It also matches excellently with Phoenix Dan Cong oolong. With Akitsu Mumyoi oxidation fired teapot, it brings up a three-dimensional drinking sensation of Phoenix Dan Cong oolong. You can enjoy the multi-layered floral and/or fruity notes. Likewise, it’s matching well with Darjeeling black tea too. The up-lifting front note is enhanced, followed by lingering sweetish taste on palate. The reduction fire means there was very less oxygen in kiln during firing. Minerals in clay were all reduced and due to rich ferrous content, the clay shows a unique color tone. This clay gives slightly less body than the oxidation fired clay but it increases aftertaste. For me, there is not very huge difference between reduction fired and oxidation fired Akitsu Mumyoi. This clay also works pretty well for all types of tea. Carbonized reduction fire means that the finished product of oxidation fired teapot was covered with charcoal or rice husk and it was fired at lower temperature (below 1000 degree C) with a lot of smoke. Among three different firing methods, the teapot fired with this technique gives strongest aftertaste but lesser body. 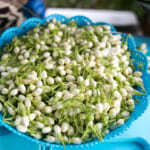 In a way, the body and aftertaste is very well-balanced and it is very rounded drinking sensation. I like to use this clay for brewing quite a number of teas, including Phoenix Dan Cong or Wuyi oolong. In my personal opinion, I would prefer to have my cup of Phoenix Dan Cong oolong brewed in a Akitsu reduction fired teapot, because for Phoenix Dan Cong oolong I prefer a little less body. With Akitsu Mumoyi Oxidation fired clay, the flavor tends to be too strong for me. But with Akitsu Mumyoi Reduction clay, I found that the flavor is just nice and I can enjoy long-lasting lingering taste down my throat for a long time.